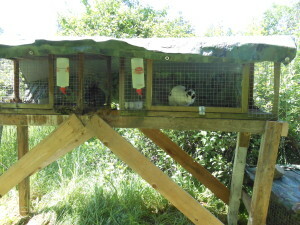 Back when we moved onto our property, we decided to raise rabbits for meat. We bought a couple does and a buck at the feed store down the road and started setting up cages for each of them. And that’s as far as we got. 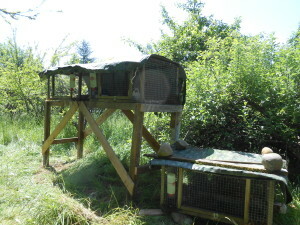 Cages built, but we just had the cages propped up on boards not very high from the ground. We did raise up and butcher several litters but now X. hasn’t wanted to have the young rabbits butchered so we haven’t been breeding them. They needed better housing with easier access and this morning I decided to see what I could pull together with what we had available. The result is simple and rough. It used wood we had around the place, some of it supporting the cages before this. One part was the post used to hold the for sale sign when our property was sold. The roof is made from recycled metal sheets that used to be a pool that we took apart and a tarp lashed down to the frame. It raises them up to an easier height. No more bending over to reach inside. Here’s another picture from further back. The buck is on rocks and boards raised off the ground, but not very high because I didn’t have enough spare lumber around to do a similar platform for his cage. The plant right behind them is an apple tree that fell over in a storm but has survived despite being split in half. I plan to remove it, but that’s another thing that hasn’t happened yet. In addition to getting their cages cleaned and relocated they also had their nails trimmed. 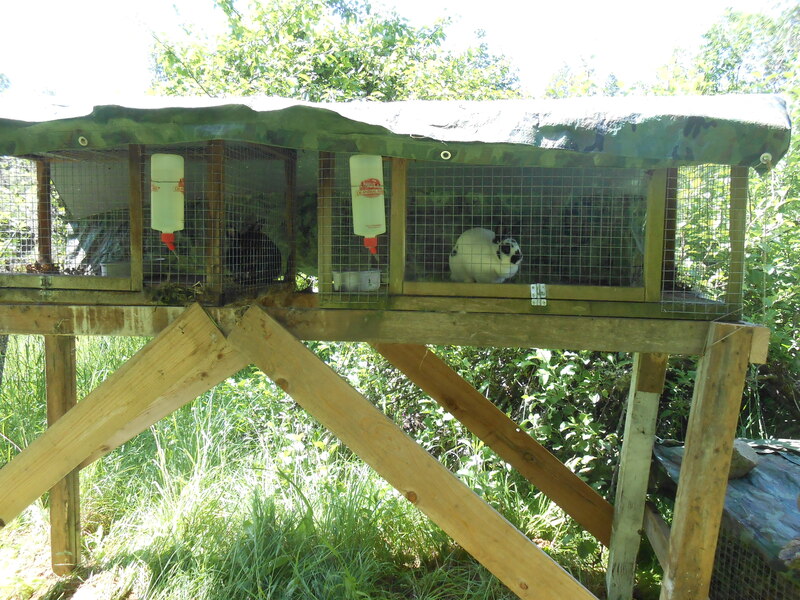 Barb, Margie and Nicky are now settled into their new location. We haven’t been posting much on the site in part because it’s easy to get discouraged with how little we’ve accomplished compared to what we’d like to do. Lately I’ve been working on trails around the property, and clearing the area where I need to dig up the septic tank to get it pumped. That’s the next big project.